These clocks use binary code—the language of computers—to show the time. After a few minutes' practice, you'll be able to read the time by adding the values of the lit LEDs in each column. 12 or 24 hour mode. Automatically senses 60 or 50 HZ. Dimensions (in packaging): 7.5" x 5.5" x 2.5"
"Happy times are here again . . . !" 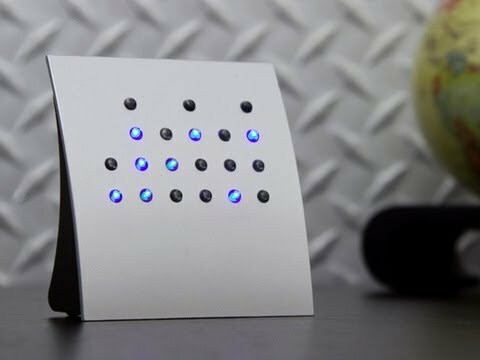 We have had our binary clock for several years, and it almost always draws attention and comments. 'What's that thing?" is the most frequent question we get. When I try to explain the 1, 2, 4, 8 and the carious combinations of lights -- I get blank stares that seem to say, "What the heck are you talking about?!" I especially like the 3 settings for the d display brightness. The style, color, shape is very nice. Great conversation piece. The display changes constantly as time passes, and it’s mesmerizing to watch. Lyle’s timepiece is elegant, a great conversation starter, and also educational. Using binary code to represent a familiar value, like time, makes it a little easier to comprehend how the coding system could be used to represent text and other characters within computers. It just might spawn a new hobby or jumpstart a young coder’s imagination.